Hello and welcome to my Falken Wildpeak H/T tire review. Buyers of SUVs and crossovers can’t be more different. Most people buy them for the sheer presence on the road, some buy them for the lifestyle aspect, some for the vast space they offer inside, and some (and this is the smallest amount) buy them for their off-road prowess. In this review, we’re going to talk about SUV and crossover buyers that fall into the first three categories, or in other words those who don’t drive off-road. This is a big portion of the SUV and crossover market, and consequently on the tire market as well. While all-terrain tires may sound like the better choice for an SUV vehicle, if you only drive on-road, there is really no reason to buy them. Instead, you’d be better off with highway or touring tires. Most of these can provide you with some traction in off-road scenarios, but I am talking about meadows here and not heavy terrain by any means. What the highway tires bring to the table is high levels of comfort and quietness, accompanied by good traction in dry and wet weather. Traction in snowy weather is always a plus, but it should only be a priority if you live in areas with harsh winters. One of the best highway tires aimed at SUV and Crossover owners is the Falken Wildpeak H/T – a proper all-season highway tire with big sidewalls, that will look good on almost any SUV. Hell, there is even a model with white letterings if you’re into that kind of look. 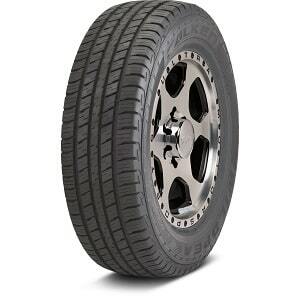 The Falken Wildpeak H/T is an all-season tire designed for light-duty pickup trucks and SUVs. It comes in sizes ranging from 15”-20”, so it should be easy finding the right one for your vehicle. According to the manufacturer, this tire offers a “combination of superb dry handling and responsive wet braking on all roadway surfaces”. The nondirectional symmetrical tread pattern with a high-tension casing ply and stiff wide steel belts helps for better stability, optimized traction, and comfort on the road. The high mileage tread further distances this tire from the pack, giving long-lasting performance and durability akin to a touring tire. Other than the materials used, the Wildpeak H/T is equipped with a five-rib tread pattern and four large straight grooves for better performance in the wet and less hydroplaning, while the continuous center rib should provide better high-speed stability and shorter braking distances. All in all, this tire has a lot going for it, but how will it handle everyday usage scenarios? Let’s find out. Tires used on heavier vehicles, such as pickups and SUVs, tend to have a shorter lifespan than those made for lighter vehicles. Well, that is unless you have the Wildpeak H/T. Falken really exceeded expectations with this tire – on SUVs it can last up to 40,000-miles if driven gently, and up to 30,000-miles on pickup trucks. These results are amazing for this class and even better than some premium tires. Even more impressive is the fact the Falken Wildpeak H/T keep their performance intact even after thousands of miles driven, something that can’t be said about other tires priced closely to this one. When you put the price in the equation, it’s a no-brainer really – this is the tire you should buy if you are concerned about durability. If you want maximum handling performance, this is not the tire for you. However, if you’re a more leisure driver, the Falken Wildpeak H/T may suit you just fine. They are certainly not the best handling tires in the class – that accolade goes to the Michelin and Bridgestone equivalents, but it’s far from the worst as well. There’s a reasonable amount of traction and braking performance on dry and hot pavement, and the tires hold really well when the weather is colder as well. One small thing that bugged me is the lack of precision behind the steering, wheel, but that’s not something you often want in a pickup or SUV tire. It’s just the enthusiast in me talking. It should be noted here that this is not an all-terrain tire and you shouldn’t expect it to offer good off-road traction. Everything I said about performance in dry conditions can be applied to wet conditions as well. This is far from the best tire in the rain, but it is far from the worst either. It offers a good amount of traction both in light and heavy rain and feels predictable and safe behind the steering wheel. This is something that most SUV owners would want in their vehicles, all the more reason to recommend this tire. The Falken Wildpeak H/T may be an all-season tire, but snow driving is not its gusto. Sure, if there’s unexpected snow on the surface you can get by with careful driving, but for harsh and heavy winters you’d be better of with a proper winter tire. Or some all-weather tires in this class, that truth to be told will be much more expensive. Tires in this category tend to be noisier, but I am still to hear a sound from these tires. Okay, I lie, they still produce sound at higher speeds (highway driving), but it’s much less pronounced than in other models in this class. This is one of the quietest highway SUV tires out there! And it’s not just aural performance where this tire excels – it’s very comfortable over bumps as well. You will have hours and hours of supremely comfortable road trips with these tires. Seriously, if comfort is high on your list, you should absolutely consider this one. One more time, Falken shows that they know how to make a tire that can do almost everything right, at a reasonable price. The Wildpeak H/T is one of the best light-duty pickup and SUV tires out there and it should be on anyone’s list when the time comes for change. It offers very good traction in dry and wet conditions, supreme comfort over bumps, quiet ride, and long-lasting durability. Highly recommended!